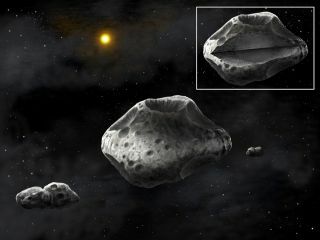 Artist's concept showing the large 270-km asteroid Sylvia surrounded by its two satellites, Romulus and Remus. The primary asteroid of the system may have a dense, regularly-shaped core, surrounded by fluffy material. The two moons are strongly elongated and composed of two lobes. Scientists have learned some key characteristics of a gigantic asteroid and its two moons, with a bit of help from sharp-eyed amateur astronomers. Observations by amateurs helped researchers determine that asteroid (87) Sylvia, a space rock 168 miles wide (270 kilometers), appears to have an irregular shape and a dense, spherical core surrounded by a layer of relatively fluffy material. Further, the asteroid's larger moon, Romulus, is about 15 miles (24 km) wide, scientists said. "Thanks to the presence of these moons, we can constrain the density and interior of an asteroid, without the need for a spacecraft’s visit," he added. "Knowledge of the internal structure of asteroids is key to understanding how the planets of our solar system formed." Sylvia and its moons as seen from the 8 to 10-meter class telescopes with adaptive optics. The dark circle shows the irregular shape of the asteroid. The small satellites can be seen at various positions on these images. Marchis and his team conducted a long-term observing campaign of (87) Sylvia, which lies in the main asteroid belt between Mars and Jupiter. They used big telescopes equipped with sophisticated adaptive-optics systems, such as the Keck Observatory in Hawaii and European Southern Observatory instruments in Chile. These observations helped the scientists devise accurate models of the triple-asteroid system, allowing them to predict the position of the two moons around the big "primary" space rock at any time. These models were put to the test on Jan. 6, 2013, when (87) Sylvia passed in front of a distant bright star, an event known as an occultation. The research team collaborated with EURASTER, a group of amateur and professional astronomers, to observe this occultation, which was visible across a narrow stretch of Europe from France to Greece. About 50 people turned their telescopes to the skies, and a dozen managed to spot the occultation, which lasted between four and 10 seconds depending on the observing location. "Additionally, four observers detected a two-second eclipse of the star caused by Romulus, the outermost satellite, at a relative position close to our prediction," study team member Jérôme Berthier, an astronomer at the Paris Observatory, said in a statement. "This result confirmed the accuracy of our model and provided a rare opportunity to directly measure the size and shape of the satellite." That shape resembles a dumbbell, suggesting that Romulus may have formed from the debris shed by a proto-Sylvia after a massive impact billions of years ago, researchers said. Marchis presented the results today (Oct. 7) at the 45th annual Division of Planetary Sciences meeting in Denver.